Throughout the generations many people have sought out direct ways to contact the recently dead to ask them questions, or just to settle a burning desire to learn if there is truly life after death. Many over the years have always pointed out the calling up the ghost of its dangerous. And of course by all past down stories it truly is. After Samuel's death and burial with due mourning ceremonies in Ramah, Saul had driven all necromancers and magicians from Israel. Then, in a bitter irony, Saul sought out the witch, anonymously and in disguise, only after he received no answer from God from dreams, prophets, or the Urim and Thummim as to his best course of action against the assembled forces of the Philistines. Following the orders of the king, the woman summons the ghost of Samuel from the abode of the dead, to give him advice.This, however, is not given. After complaining of being awakened from his long sleep, the prophet's ghost berates him for disobeying God, and predicts Saul's downfall, with his whole army, in battle the next day, and adds that Saul and his sons will join him, then, in the abode of the dead. Saul is shocked and afraid, and the next day the army is defeated and Saul commits suicide after being wounded. The prophecy of Samuel is largely a repeat verbatim of the public words of Samuel when he was alive, in 1 Samuel 15. The only new information is that Saul will die "tomorrow". And yet if the events of chapters 28-31 are in chronological order, if so then Saul did not die until three or four more days, to allow time for the movements of David's troops from Jezreel to Ziklag. In which case the only new information, "tomorrow", added by the séance at Endor was incorrect. In Judaism, some rabbis taught that the spirits of the dead hovered around the body for a year after a person died; this made the spirit of the dead person amenable to being truly summoned during this time, and indicated that the spirit so summoned truly was Samuel, and that Samuel was indeed supernaturally summoned by the witch. Often I receive emails asking about how to use Ouija Boards and if there is a danger of opening up portals to allow demons to possess someone and if Ghost Hunting is just a modern form of the tried and true séance I also get many concerning where you can a person buy an emf meter that works and is cheap. Or what is the best way to capture ghost speaking through EVP's. And if a Frank's Box or ghost box contraption like the Ovilus is 100% reliable in communicating with the dead. I just want a simple, easy, and un harmful way to contact a ghost to ask questions. Is using my Tarot cards to contact ghosts safe? Can ghosts materialize from ectoplasm? But the serious inquires that usually come more often ask what is the best and surest best method to make real contact with a real ghost immediately. My direct stern advice to them always is try everything until you find the device or sure fire method that suits them personally best. But in all seriousness ghost hunting Séances and attempting to contact the dead is not for everyone. Paranormal studies are as many will certainly state only for those sound of mind and spirit. too many individual often embark on trying to reach the dead to answer the questions they feel are left unanswered and in their attempts to contact a dear lost loved one they open their hearts and minds to forces that will over rule them and bring them a greater sorrow then they have ever known. Methods For Calling Up And Speaking To The Dead! There are as many will attest several tried and true methods to contact and question the dead. Attend or host a formal Séance was the usual method tried in the late 1800's until the advent of ghost hunting. Today many believe that ghost hunting and the methods of collecting EVP's is just a spin off of the actual séance tradition. A séance is an attempt to communicate with spirits. The word "séance" comes from the French word for "seat," "session" or "sitting," from the Old French "seoir," "to sit." In French, the word's meaning is quite general: one may, for example, speak of "une séance de cinéma" ("a movie session"). In English, however, the word came to be used specifically for a meeting of people who are gathered to receive messages from spirits or to listen to a spirit medium discourse with or relay messages from spirits; many people, including skeptics and non-believers, treat it as a form of entertainment. In modern English usage, participants need not be seated while engaged in a séance. Mediumship is the term used to describe an act where the practitioner attempts to receive messages from spirits of the dead and other spirits that the practitioner believes exist. Some self-ordained mediums are fully conscious and awake while functioning as contacts; others may slip into a partial or full trance or an altered state of consciousness. These self called 'trance-mediums' often state that, when they emerge from the trance state, they have no recollection of the messages they conveyed; it is customary for such practitioners to work with an assistant who writes down or otherwise records their words. "Channeling" is a modern term for mediumship and is found most often in descriptions of stage mediums and leader-assisted séances who convey messages from spirits who are thought to be teachers of wisdom. Channeling is a process by which the medium allows a spirit limited use of his or her physical body to communicate with the sitters present. This is distinct from the concept of possession, which is considered to be the complete, non-consensual takeover of a living being by a spirit. Channeling, on the other hand, is assumed to offer opportunities for more positive and mutually respectful interaction between the living medium and the spirit. Collection of EVP's Leader-assisted ghost hunting séances today are generally conducted by small groups of people 2 - 5, with participants seated around in a dark or semi-dark room. Asking unseen forces to interact. By making sounds that they often say are audible voices. The leader is typically asserted to be a medium and he or she may go into a trance that theoretically allows the spirits to communicate through his or her body, conveying messages to the other participants. Other modes of communication may also be attempted, including psychography or automatic writing, numbered raps, levitation of the table or of spirit trumpets, apports, or even smell. This is the type of séance that is most often the subject of shock and scandal when it turns out that the leader is practicing some form of stage magic illusion or using mentalism tricks to defraud clients. The history of séance communication may be traced back to the third century. It was during the 1800's that the séance became popular mainly due to the stardom of the Fox sisters. And don't forget apports might just appear out of thin air. Commanding The Dead To Appear! Necromancy and it's secret rites has as many believe been one of the dark arts that does produce direct ghost and ethereal spirit conversations between the living and the dead. But as many will tell you necromancy is not for everyone for it goes against the beliefs of some religious groups and practices. Nigromancy (Latin niger, "black"; Greek manteia, "divination") is black magic, mentioned in medieval books such as John Lydgate's A Royal Nigromancer, and Richard Johnson's Historie of the Seven Champions of Christendom, wherein some nigromancers are pitted against Christian Saints. Both Nigermancy and Necromancy are as many relate forms of divinations to learn of future events or things hidden from us that we seek out the answers to. Simple reasons people questions ghosts is to find out if someone loves them or if they are cheating on them. 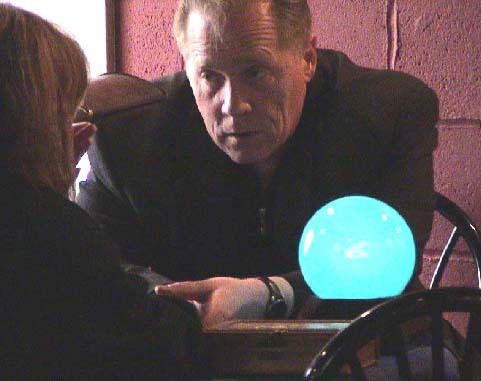 Séances in the past usually consisted of the sitters wanting to learn everything from where a person is after death to what mysteries of the other side that could be revealed. The attitude of the Bible toward divination is decidedly ambivalent. On the one hand, verses like Deuteronomy 18:10-12 clearly forbid any acts of divination, describing them as something detestable to God. On the other hand Exodus 28 gives members of the priestly class the authority to perform divinatory rituals inside the temple. Priests used the Urim and Thummim to divine the will of Yahweh before times of sacrifice. Divination appears to be condoned in several places in the Hebrew Bible such as the chastisement of Noah, the journey of the sons of Jacob to Egypt, and the selection of a king by Samuel. It appears not so much that divination is forbidden in the Bible, but its use was restricted to people whom God appointed. Divination by members of other religious sects, for example in the context of witchcraft and necromancy, is forbidden. Spirit boards, also known as talking boards, or Ouija boards (after a well known brand name) are flat tablets, typically made of wood, Masonite, chipboard, or plastic. On the board are a number of symbols, pictures, letters, numbers and/or words. The board is accompanied by a planchette (French for "little table"), which can take the form of a pointer on three legs or magnifying glass on legs; home made boards may employ a shot glass as a planchette. A most basic Ouija board would contain simply the alphabet of whatever country the board is being used in, although it is not uncommon for whole words to be added. While Ouija believers feel the paranormal or supernatural is responsible for Ouija's action, it may be explained by unconscious movements of those controlling the pointer, a psychological phenomenon known as the ideomotor effect. The board is used as follows: One to all of the participants in the séance place one or two fingers on the planchette which is in the middle of the board. The appointed medium asks questions of the spirit(s) with whom they are attempting to communicate. The use of mirrors in contacting the dead have been around for century's. From gazing in it to call up Bloody Mary or just to see the face of dead loved ones. Ghost or haunted mirrors which are under the powers of paranormal or supernatural elements are thought to exist world wide. Such notable mirrors are The Myrtles Plantation haunted Mirror, The Death Mirror of New York, The Ghost Mirror Of Galveston, Texas, The magic Mirror of London, and the frightening The Haunted Ghost Mirror in Japan. Look into any mirror ... Do you see a ghost? Or does a real ghost see you? Invisible and watching you from the other side in it's backwards world. Many old mirrors thick and old and silver back stained are said to be haunted by the ghosts of those that died. their image forever frozen or trapped in the glass. Some recent stories on eBay tell of people selling their antique mirrors that were either bought or passed down the generations in their families and said to be very haunted . It is said by some that if a ghost or lost soul wanders your home during the night, a mirror can capture it. An old New Orleans Voodoo way to capture a ghost was to put a large standing mirror in your bedroom door way. When the ghost thinking it is a door enters the mirror it is forever trapped in the rooms that were reflected in it when caught not the real rooms. Mary is summoned whenever young teen aged girls get together for a sleep over, but boys have been known to call on her too. The 'Bloody Mary' legend was common in the early 1970s. Typically performed the "ritual" in bathrooms, because the bathrooms of suburban homes had large mirrors and were easily darkened even during the day since they had no windows. In latter years after the release of the movie Clive Barker's Candyman (1992) calling upon him became more popular. Many do believe the Candyman's Movies premise is based on fact and try summoning him even today. Mirror ... Mirror on the wall you make my skin creep and crawl. Whose the ghost that resides within... The spirits of the dead the lost or my next of kin! Fear of mirrors probably arose from the time when the first humans saw their reflections in a pool of water and once they had got over their initial shock of seeing someone or something, believed that the image was their soul or spirit and to endanger it would mean risking injury to the other self. Also since ancient times, mirrors were said to have magical powers, including the power to foretell the future and were considered to be devices of the gods. Thus breaking a mirror would end its powers and bring untold miseries and misfortunes upon the one whose reflection it last held. Or even damning a trapped spirit to a hell that only the Devil himself knew existed. Mirrors are the perfect example of an everyday household furnishing attached with countless superstitions. Probably the most common belief concerning mirrors is that their breakage causes seven years of bad luck. But does Breaking a mirror with a real ghost locked in it set it free to haunt you? Consider this: Was the ghost trapped their on his own or placed their by some force to trap it to save others from the haunting the ghost could cause? In New Orleans Voodoosit are said to use a grand spell to capture household haunting ghosts in Zombie bottles or large mirrors. The mirrors which render the ghost harmless only to haunt the world that is reflected in the mirror. Not the Real world we live in. One custom unique to New Orleans voodoo is to watch ( particularly if it is a bad or evil spirit or ghost) wander into a room or door way reflected in the mirror then to smash it trapping the ghost forever to roam into a different eternity and not haunt your house any longer. And to tell if a old mirror given to you or purchased is haunted place to tall white candles no further then 12 inches apart . Do this at midnight. Focus your eyes at the space between the two candles if it is haunted you will see the ghost! What to do when you break a Ghost Haunted mirror!?! Go to the nearest Haunted Cemetery place a piece of the mirror on a grave or on top of a tomb or headstone and the hex will be lifted right away. "Spirit ,specter, ghoul, or ghost, Fear now the power of God and his blessed Host! Flee this spot where you were fallen and set free, and in your eternal rest you shall ever be!" On the first night after breaking the mirror, light a blessed white candle on the spot where it fell. The Haunted mirror is symbolic among other things, when hung in a kitchen or dining room. Hang one beside the table in the dining room or kitchen to attract wealth and food to the home. No new mirror should be hung in the room a person has died in for 16 months after. And it should be a new mirror not one from another room that once caught their reflection. Dining room and kitchen mirrors feed hungry ghosts or Voodoo Spirits. The reason is the belief that the ghost eat the reflected food set out before them. Some cultures say this form of dumb supper taken from the southern style Marie Laveau Hoodoo Voodoo traditions. This works better in communicating with a ghosts and Spirits or Loa's that expect to be fed. And often the Ghosts will not be appeased until a banquet is set out before them. If you see people you know who have died in your mirror but they have never been reflected in it until then. They are trying to warn you of something. Be careful and ask for a message aloud at midnight. They will answer! If a mirror in the house falls and breaks on its own, A evil ghost is trying to escape it's mirror prison. Many people dismiss this as only a parlor trick to today's new technology. Whether this or any type of Frank's box is a actual working ghost tool it is still up to personal discretion to whether to believe in its results as proof that you are in contact with the dead, ghosts spirits or demons. Some paranormal investigators seem to be also up in arms complaining in blogs and chat rooms for the fact that the iOvilus application is actually opening up portals in which unsuspecting teens run the risk of being possessed by unseen entities. Many think it is just a game says Lisa Lee Harp Waugh the American Necromancer. Who has in resent years investigated everything from the common Franks Box and many other EVP and ghost speech boxes. "I believe through my personal research with such items that many consider it just a toy where others take it seriously." " I can remember back in the early 1970's in Marshall, Texas I had a friend who believed everything her magic 8 ball told her to do." Certainly they will come the day when someone will commit a crime and blame it on the iOvilus app's ghost who told them to do it." Said Waugh. "The application on the iphone as all paranormal equipment on the phones is freely distributed for a small fee and left up to us to be for entertainment only." " But we must realize that their or some who take such matters seriously and these things can distort their reality to the point of committing serious problems in their lives and in those around them." Another electronic device specifically constructed in an attempt to capture EVP is "Frank's Box" or the "Ghost Box". Created in 2002 by EVP enthusiast Frank Sumption for supposed real-time communication with the dead, Sumption claims he received his design instructions from the spirit world. The device is described as a combination white noise generator and AM radio receiver modified to sweep back and forth through the AM band selecting split-second snippets of sound. Critics of the device say its effect is subjective and incapable of being replicated, and since it relies on radio noise, any meaningful response a user gets is purely coincidental, or simply the result of pareidolia. Digital Dowsing www.digitaldowsing.com equipment has appeared to date on the SyFy Channel, A&E, The History Channel, Animal Planet, E! , Discovery Channel and on NBC's Today show. Bill Chappell, lead designer and engineer for Digital Dowsing will appear in two episodes of the Travel Channels Ghost Adventures. And many people are more then astounded when they first see this hot item known as the Ovilus. MAny people have searched and searched to purchase one of their own and come up short handed. Sadly technology changes and the original Ovilus is no Longer in production. The new Ovilus II and the Ovilus iPhone app are now taking it's place to many cheers and jeers. But the good news is the Ovilus II and iOvilus have taken it's place to rave reviews and a touch of serious skepticism still prevails. interface to talk with spirits has been a serious search for many iphone users wishing to consult with the dead or just to carry on a conversation with the invisible world around us. The Ghost radar as many young ghost hunters have stated now has them afraid of their own shadows. Some though are still very skeptic of it's use and purpose and call it the parlor trick of the 21st century. And to those groups that openly professed it great new use in the field on television and in documentaries they seem to be all stepping away and distancing themselves from it's use. A famous Paranormal TV personality who wishes to remain anonymous told me for what they once toted as the newest and best ghost hunting equipment to ever be invented is nothing more then a joke that got played on them and they will never use one on their show again since the application release on iPhone. Many had once openly stated that they felt if Edison was alive today he would have been the inventor, or that his research is what brought this exquisite piece of equipment into being. Though now many fear the negative attributes the application and equipment is receiving today, Then of course there are those that still stand behind it as being 100% legit. Many stories over the years concerning particular types of séance candles able to bring the dead or cause them to appear have often been noted. From using only black tall tapers or those that are blessed and bought from a church. Many warn never use a séance candle for any other purpose then calling up the dead. Also disposal of them should be done with great care otherwise the ghost you have summoned with them will forever haunt you if it is not buried in a a deep grave at a cemetery at midnight on the dark of the moon. Automatic writing is the alleged process or production of writing material that proponents claim does not come from the conscious thoughts of the writer. Practitioners say that the writer's hand forms the message, with the person being unaware of what will be written. In some cases, it is done by people in an alleged trance state. In others, the writer is aware (not in a trance) of their surroundings but claims not to be aware of the actions of their writing hand. Automatic writing, or psychography, is a concept in spiritism by which spirits are claimed to dictate or take the hand of a medium to write messages, letters, and even entire books. Their are some artist who insist that ghosts take over their hands and minds when actually doing a painting or a sketch. Speaking ill of the dead or through actual intimidation through threats and name calling. Provoking ghost to appear may work for some but in many cases it also brings down their wrath upon you or so it is believed. Electronic voice phenomena (EVP) are electronically generated noises that resemble speech, but are not the result of intentional voice recordings or renderings. Common sources of EVP include static, stray radio transmissions, and background noise. Some have claimed these sounds are of paranormal origin, while there are natural explanations such as apophenia (finding significance in insignificant phenomena), auditory pareidolia (interpreting random sounds as voices in their own language), equipment artifacts, or simple hoaxes. Recordings of EVP are often created from background sound by increasing the gain (i.e. sensitivity) of the recording equipment. Visit the most haunted locations where real Séances are held regularly. Cassadaga Spiritualist Camp is a 115 year old community of spiritually-minded people located in Central Florida. Lily Dale, a spiritualist community in western New York. New Orleans is also a hot spot for private séances and spiritual voodoo rituals in which the spirits of the dead are often summoned. Best Time To Try To Contact A Ghost. Holidays are always a good time to try to contact those that have passed before us. Be it Halloween or on all Souls or Saints day. Many believe this is the perfect time of the year when the dead are more apt to approach the living. Those in the Far East believe it to be the 8th month of the year which is Hungry Ghost Month. And also please see: "The World's Most Famous Ghost" The Top Ten Most Famous Real Ghosts You Could Ever Encounter! And these listed here are The World's Most Famous Ghost that haunt us still to this day. And of course they are all women!